Love Thai curry but not so keen on heat? Why not opt for this savoury dish? 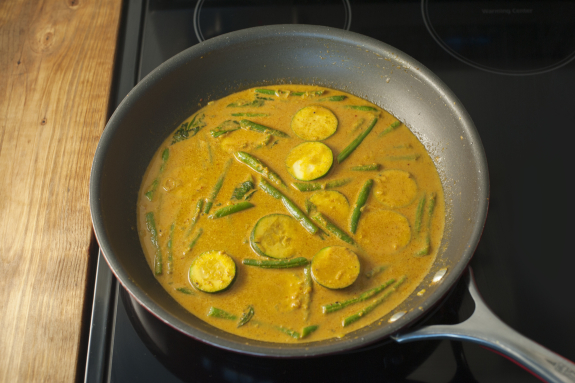 It incorporates mild yellow curry paste along with scallions, garlic and ginger to create a sauce that is brimming with flavour. Multicoloured quinoa is cooked with a splash of coconut milk and lime until bright and fluffy, making the perfect bed for our pan seared tofu and fresh zucchini and green beans. No burning taste buds required to enjoy! Zest and juice the lime. 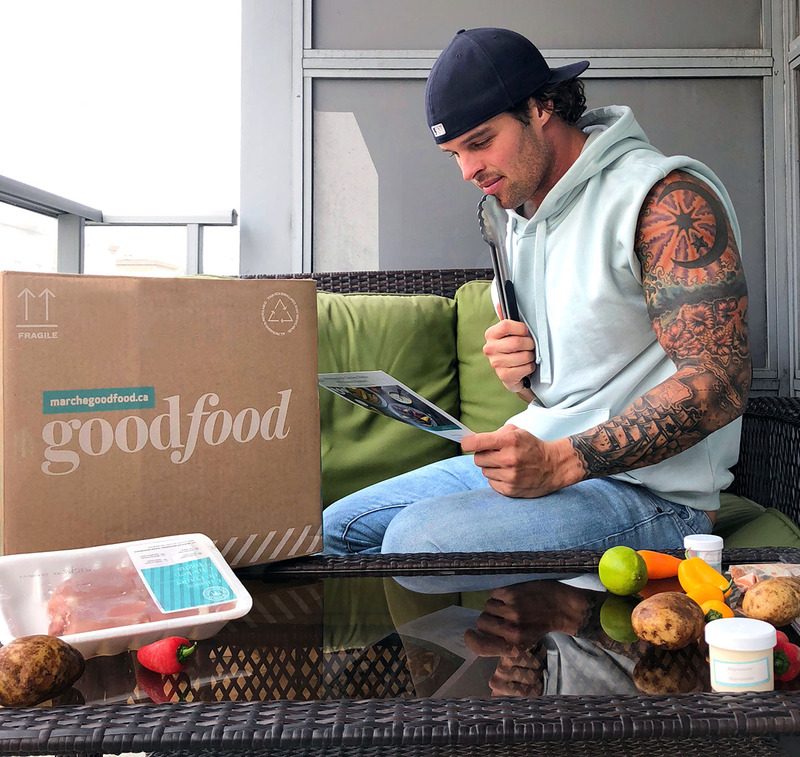 In a medium pot, combine the quinoa (rinse before adding), ½ the lime juice and zest (or as much as you’d like), 2 tbsp of coconut milk (shake before opening), 1 cup of water (double for 4 portions of both) and a pinch of salt; bring to a boil. 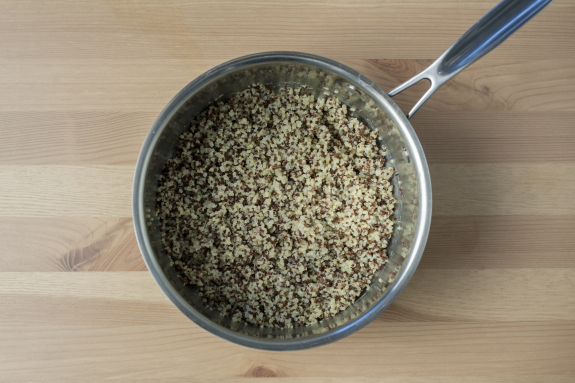 Reduce the heat, cover and let simmer, 14 to 16 minutes, until the quinoa is tender. Fluff with a fork and set aside in a warm spot. While the quinoa cooks, cut off and discard the stem ends of the green beans; halve the green beans crosswise. Cut the zucchini into ¼ -inch-thick rounds. Cut off and discard the root end of the scallion; thinly slice, separating the white bottoms and green tops. Peel and mince the ginger. Mince the garlic. Pick the Thai basil leaves off the stems. 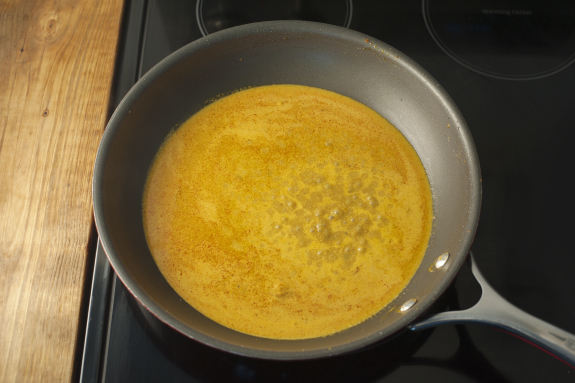 In a large, high-sided pan, heat a drizzle of oil on medium-high. 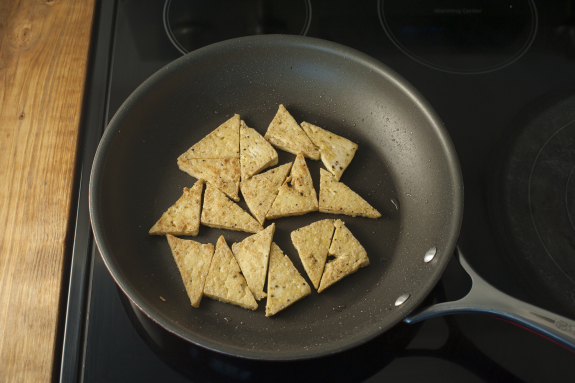 Cut the tofu into ¼-inch-thick slices and halve diagonally. Pat dry with paper towel; season with S&P. Add the tofu to the pan and cook, 2 to 3 minutes per side, until golden and heated through. Set aside in a warm spot. Reserve the pan. In the same pan, heat a drizzle of oil on medium-high. Add as much of the curry paste as you'd like (use half for mild), white bottoms of the scallions, garlic, ginger and as much of the remaining lime zest as you’d like. Cook, stirring frequently, 1 to 2 minutes, until the curry paste is toasted and the aromatics are fragrant. Add the remaining coconut milk and 1 cup of water (double for 4 portions). Simmer, stirring occasionally, 3 to 4 minutes, until beginning to thicken; season with S&P. 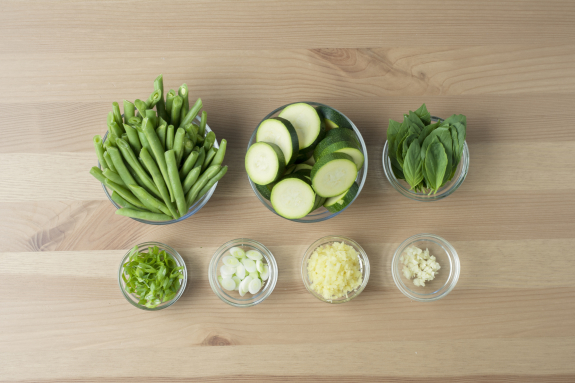 To the pan of curry, add the zucchini, green beans and ½ the Thai basil; season with S&P to taste. Cook, stirring occasionally, 3 to 4 minutes, until the vegetables have softened. To the pot of coconut-lime quinoa, add the green tops of the scallions; stir to combine and season with S&P to taste. To finish the curry, add the tofu and as much of the remaining lime juice as you’d like. Stir to combine; season with S&P to taste. 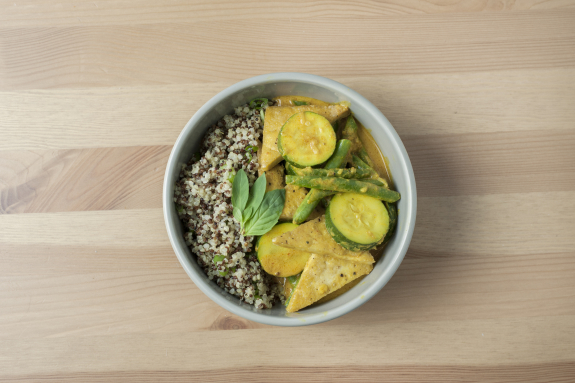 Divide the tofu curry between your plates and top with the remaining Thai basil leaves. 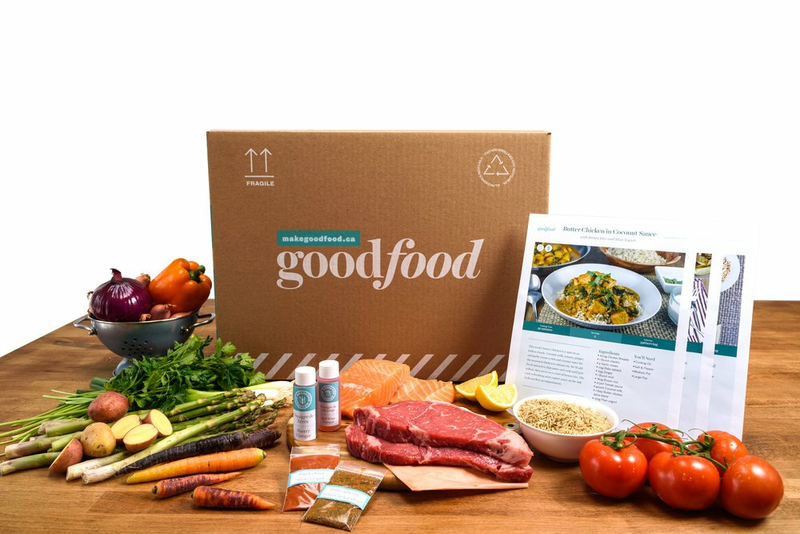 Serve the coconut-lime quinoa on the side. Bon appétit!